Some background information first of all: I'm 16 now and just started studying mathematics intensely. I live in the UK and my goal is to eventually become very good at advanced mathematics (graduate level and up) but that is still far in the future. I'm about a year or slightly more ahead from the expected curriculum knowledge in my age group. The advice I'm seeking of is that I am not sure whether to keep going ahead of the curriculum and eventually learning university maths a year before actually going to uni or should I try to improve my problem solving skills by for example trying out Mathematical Olympiad questions. If I do MO instead then I fear I might be wasting time (even if I'm improving at problem solving) when all I really want to do is the more advanced stuff which is more proof laden I hear anyway. To answer the question it might be helpful to know what my intentions for pursuing mathematics are. I enjoy learning new fields of mathematics that I did not know of before. A new topic excites me, a new problem to solve with the same tools just doesn't have the same effect on me mentally. I can pick up stuff quiet quickly and get bored if I'm forced to keep doing what I already know without any new knowledge. I realise however that mathematical ability is not just about knowledge but also problem solving skill. Each has their benefits. I'd suggest taking some time to research each one and trying to figure out which grabs your attention the most. Then you can invest a more substantial amount of time and figure out if it really is someone you enjoy. If not, you've definitely got time to change your mind. The point though is to just find something you like and run with it. It would be nice if you could learn some basics of calculus. But be sure first that you are already good at the very basics of algebra, identities, logarithms etc. Do not try Math Olympiad problems. In my opinion, they train you to be a good "warrior" for 3 hours (the exam) but a mathematician is not a warrior and certainly has plenty of time. Try to understand the proofs you read and not only memorize the theorems. Along with Calculus a good advice would be to study Number Theory. This way you will see what mathematical genius actually is. Trust me! Nothing is wasted. Hard problems which force you to think are always good. Cambridge University has a reading list and there is more information on the website. And I guess other faculties will do something similar. My personal experience in the US is that there is a vast difference between the typical high school curriculum (algebra, calculus which are primarily learning methods) and what might be considered pure math. The ability to prove things (as several others have mentioned) is paramount. This also entails recognizing what conditions are necessary and sufficient, where thins can fall apart, and a wonderful exercise in self-reflection to consider if you really know what you are doing. That said, I feel (once you have a familiarity with calculus, also mentioned above) that you persue a particular course. Many programs begin with real analysis. The benefit of this is that math knowlegde is often cumulative, and thus following a course will have the added benefit of seeing how and where prior developed material comes into play. This is quite different from a non-math or science program, as you can read any Shakespearian play or Wordsworth poem without any prior experience. If you are interested, here is a link to a free down-load of a RA course given by Vaughan Jones (Fields Medal). They are self-contained meaning they start at the beginning, and you need not look elsewhere as you progress. (Notice however the first few pages are a bit technical for thoroughness, so take a glance, and start a page 4.) There is nothing like the real thing. I would recommend reading Velleman's How to Prove it, which teaches you about how to think logically and construct mathematical proofs. This is often the biggest hurdle for new mathematics students: figuring out what constitutes a proof, what are logically valid arguments, and how to present a proof. Alongside Velleman, I would recommend Axler's Linear Algebra Done Right. Linear algebra is the study of vector spaces (and later on, modules) and the linear transformations between them. Linear algebra plays a key role in every field of mathematics, as well as in physics and computer science. For example, the derivative operation in calculus is all about linearizing functions. I was in a somewhat similar situation('discovered' math in mid-end of HS, thinking about going into competitions or directly to uni level math) and I choose the latter option. I would suggest that before doing anything else you should get your hands in an "advanced" calculus text to learn what a proof should look like(e.g. Apostol's or Spivak's for a gentler introduction) and learn some logic/set theory with something like Halmo's Naive Set Theory since both are used everywhere. At this stage all you need to care about is to keep stretching your brain in many different directions. There still will be a lot of time for you to learn all the amazing theories, useful tools or amusing curiosities. Let your imagination run free and enjoy the math you do (but be serious, don't slack off). If I were to give you one advice on what to do: experiment! Each mathematician has his/her own best set of things to do and these differ considerably. I have no idea what will work best for you, I can only suspect and even that is warped by my own subjective perspective. Of course, I have some observations about what worked and what did not for my friends or students I taught, on this observations and various musings of others I based the advice that follows. However, you won't really know what works until you try it - each to his own. If you had to choose between knowledge and thinking, at this stage I urge you to pick thinking. I know no conclusive research on this topic, but to me it seems that thinking capabilities work similarly to other human traits, that is, the early years determine the limits you can later achieve (the cap on your abilities). It doesn't really matter that much what kind of math do you do, as long as you keep stretching your brain in different directions. Also, whatever you do, be serious, don't slack off. Personally, I would advise you against learning advanced material and study university topics ahead of time (more on this below). Instead, practice a lot of Math Olympiad problems, but optimize for brain-stretching, not for contests (more on this also below). Another thing that would be great to do is to experiment with math. Take some math and use it, or find some practical (getting purely abstract too soon won't do you any good) problem (it might small and insignificant, doesn't matter) you would like to solve and try to do it with math (perhaps learn some new things in the process). Make a simulation of a lunar lander (the graphics can be trash) according to physics equations, including (at least) mass, gravity, atmosphere density (to have some damping effects) and thrust forces from engines. Represent them as differential equations and solve numerically (use something simple like Verlet). Code a minimal raytracer. Try to use homogeneous coordinates inside and Monte Carlo methods during rendering. Also, play with transformation matrices. If these sound intimidating, don't worry, they are much easier than they seem and you can find a lot of help online (tutorials, forums, stack-exchange sites, etc.). Besides, you don't need to understand all the details of the underlying theories, to complete these tasks you only need to learn a few bits for each (e.g. derivatives and integrals, complex numbers and polynomial evaluation, matrix multiplication and some randomization). In fact, a few paragraphs below I will argue that you should not learn too much advanced material too early. The above tasks require some programming skills, but I guarantee that coding ability will be useful to you (see also here). Each has an underlying topic (differential equations, FFT, linear algebra) which is highly relevant, frequently used in applied math and amazing by itself. You will have a better understanding of what math can do, and believe me, doing it personally is a whole other experience than just hearing about it. Finally, it is great fun seeing it run! Whatever you will ultimately do, at your age, don't be afraid of rediscovering the wheel. Although in research it's better to rely on known theorems rather than prove everything from scratch (human lifespan is limited), there is no better way of learning how to invent new things (I would recommend against true open-ended research, because it's easy to get frustrated). Basically all standard textbook problems rediscover the wheel (they were solved before, weren't they? ), but somehow we understand that this is precisely their intention. However, ordinary theorems or folklore facts can also be though of as challenges. This is standard in geometry, so why not in other areas? For example, could you solve the quadratic equation without knowing/using the exact formula for roots? you train yourself in following the beaten track (rather than creating your own). Math Olympiad problems are one of the best mind stretchers I know. If you approach them right, a lot of them (depends on country) become great tryouts for your out-of-the-box thinking. The most important thing here is not to optimize to get far in the contests, but to expand your mind. For example, there is a certain set of mathematical theorems which with enough practice allow you to solve many olympiad problems with little or no insight (e.g. the Muirhead's inequality is notorious for killing fun). So when you spot a problem that is easily solvable by some "overpowered" theorem, either try to find another solution or go on to next problem. Similarly, do not measure your time when solving Math Olympiad problems. If you are stuck, try harder (rather than moving on or reading solution). If you can't stand the problem anymore, leave it and perhaps try again next week. 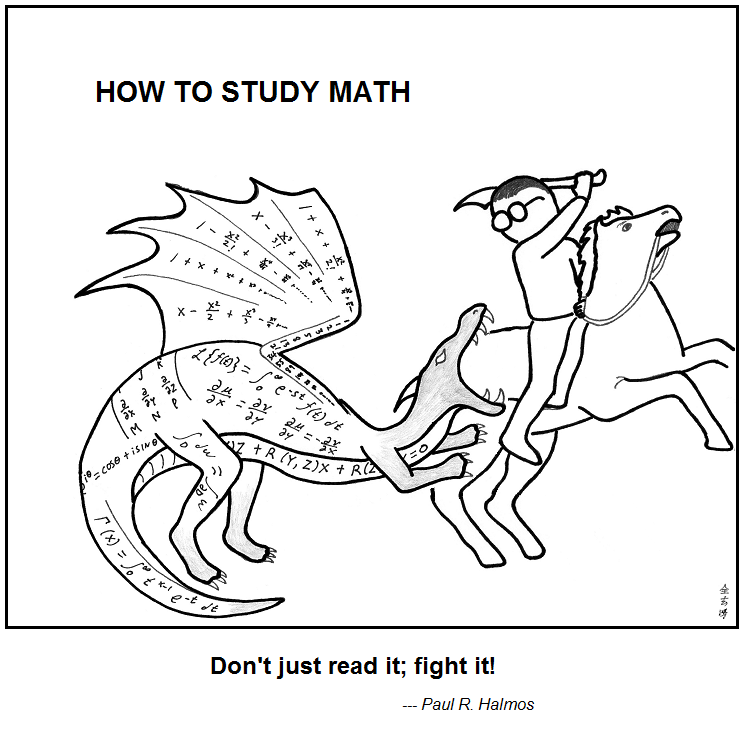 Don't just learn math, or as Paul R. Halmos have said: Don't just read it; fight it! (the picture comes from the Abstruse Goose webcomic). Not the answer you're looking for? Browse other questions tagged soft-question or ask your own question. 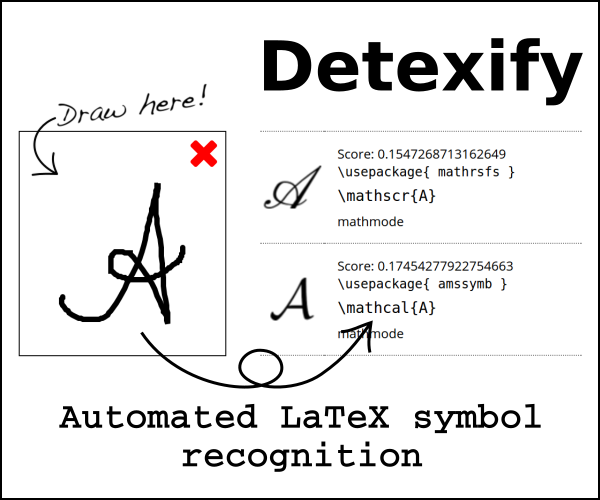 How important is programming for mathematicians? How to stay academically active during a Mathematics Gap Year? Most effective order for learning different branches of mathematics. How to proceed doing number theory? [Beginner]How to tackle mathematical proofs? As a 1st year undergrad, is it worth investing time on going through some of the IIT JEE calculus materials? How do I learn maths? I take it so long everytime I learn mathematics myself. What should I do? How do you revise material that you already half-know, without getting bored and demotivated? What subjects to study to improve “mathematical maturity/fluency” to learn more efficiently?